THE MORE I think about it, the more convinced I am that Henry Kissinger’s most signal achievement is to have got everyone to call him ‘Doctor’. There are literally millions of PhDs and second-rate academics in the United States, but he is the only one below the rank of professor to have managed to pull off this trick. And to pull it off, furthermore, without getting himself called ‘Doctor Death’ all over the place – a nickname which would suit him much more than it does the good physician Owen. There are three Mr Kissingers. The first we know through Seymour Hersh and William Shawcross, and through the testimony of his former aides. This man is a power-worshipper and a sycophant. He bugs his friends’ telephones, he arranges for governments to fall and for ‘difficult’ politicians to disappear. You can find his spoor in Bangladesh, in Chile, in Cambodia and in Vietnam, and in the slimy trail leading to the corridors of the Watergate building. This man is good at being somewhere else when things go wrong, and very good at taking the credit for things like ‘the opening to China’, which would have occurred years previously were it not for the opposition of people like Nixon and himself. The second Mr Kissinger is a feature of the chat show and the rubber-chicken speaking circuit. For vast fees, he will send a vicarious thrill through an audience of Rotarians and their wives. I have seen the act a few times now, and it was on about the third occasion that I noticed the penchant for other people’s nervous laughter that is his stock-in-trade. He understands the pornographic appeal of power, secrecy and the control over life and death. He is very good at hinting at his familiarity with these things. To the Chinese, Americans often appear unstable and slightly frivolous. To Americans, the Chinese occasionally present themselves as either inscrutable or uncommunicative. The governments of the Gulf face a fourfold threat: Shiite radicalism, Moslem fundamentalism, Iranian revolutionary agitation, Soviet imperialism. Too many seek to position themselves somewhere between the superpowers – the first step toward psychological neutralism. Thus Europe’s schizophrenia: a fear that the United States might not be prepared to risk its own population on a nuclear defense of Europe, coupled with the anxiety that America might drag Europe into an unwanted conflict by clumsy handling of Third World issues or East-West relations. There are more than syntactical problems with that passage. First, many countries actually are ‘somewhere between the superpowers’ – a position the discomfort of which Kissinger has no means of understanding. Second, having identified America as being in two minds (which it is), he awards the condition of ‘schizophrenia’ to – the Europeans! Whence cometh this man’s reputation for ruthless clarity? All great achievements were a vision before they were a reality. There are many in this room better qualified to fill in the many blanks for an overall design. My major point is that the world needs new arrangements. A burst of creativity is needed to eliminate our dangers and fulfil our promise. Swell. I hated every minute that it took to read this book, but I think it may have been worthwhile. 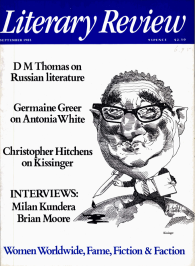 On pages 93-110 of the American edition there appears an interview that Mr Kissinger gave to the editors of The Economist in 1982. It is called ‘After Lebanon: A Conversation’. The questions are unbelievably tough. He is asked, for instance, ‘Do you see still, after recent events, an opportunity for progress in the Middle East?’ After that, the questioning gets perceptibly easier. The recorded interjections are of a toadying, collusive kind that make a Reagan press conference seem like hardball. So I think I have worked out what it is that allows the Kissinger reputation to survive. He has lied to Congress, he has betrayed his colleagues and he has seen all his famous ‘mediation’ efforts come to naught. But when it comes to the press, his diplomacy is unrivalled. Flatter the hacks, and you need never dine alone.